PT JETEC INDONESIA-ACTEMIUM INDONESIA is a subsidiary of VINCI ENERGIES Group and a business unit of the ACTEMIUM Trademark for automation and telecommunication expertise synergy. Experienced in Oil & Gas Industry and Nutrition sectors. 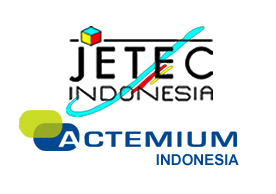 PT JETEC INDONESIA-ACTEMIUM INDONESIA is a Control System, Telecommunications Integrator and an E&I Contracting Company with his main office in Jakarta. Performance of Telecom, Hardware and Software staging. Performance of Telecom factory acceptance test. IT Support (PC/Server/Office network design, selection and maintenance). Definition of Telecom scope of work / Follow up of sub-contractors. Participate to Telecom project quotation. Knowledge of the field, preferably have experience working in Oil & Gas Industry. Good command of spoken and written english, human relation and interpersonal skill. Highly motivated, proactive, resourceful and Good Communication with interpersonal skill. Potential candidates may submit their detailed resumes to recruitment@actemium.co.id along with availability, Current & Expected salaries. Thanks for reading PT Jetec-Actemium Indonesia Jobs: Telecom Lead Engineer. Please share...!